Your company's online presence begins and ends with your website. But hiring a designer to dress it up can be expensive--and that's not even including the cost of a custom domain name and website hosting. Fortunately, you have do-it-yourself options. If you need a basic website to house and promote your business, these five services let you design, publish, and host your site for free--or for a small monthly fee--all from the comfort of your browser. 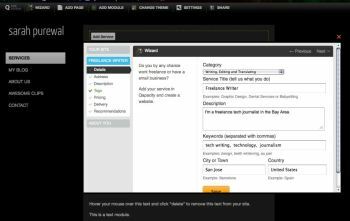 These services all feature "What You See Is What You Get" (WYSIWYG) website editors. In other words, you don't have to know a single line of code in order to build your own, professional-looking business website. Next, to make your brand's look and feel match your print materials, here's how to create print materials such as business cards and brochures. Moonfruit is a free website host and editor with a plethora of fresh designs and detailed editing options. The service is moving away from its early focus on building Flash-based sites, which can't be viewed on iOS devices and are typically hard for search engines to find. Now, a site you build in Moonfruit is designed to render in Flash, HTML, or mobile HTML5, depending on how the user is accessing it. And soon there will be tools for building Facebook Pages. Getting started on Moonfruit is quick and easy--although mastering its site editor takes quite a bit of practice. First, simply choose a theme, which you can change later, if you desire. The modern-looking, business-oriented themes include IT Services, Accounting, Spa, Bakery, and Law. All are fully customizable, but if you don't see one that appeals to you, you can choose a dark- or light-skinned blank theme and build your site from the ground up. Moonfruit has a ton of design options for building a site from scratch. Next, you can dive into the webpage editor. The Flash-based editor is full-featured but can be a little intimidating. Luckily, Moonfruit has a 40-page Beginner's Guide. You can edit the Page Master, which houses the elements that will appear on every single page of your website (such as navigation links and your logo), or you can edit pages individually. 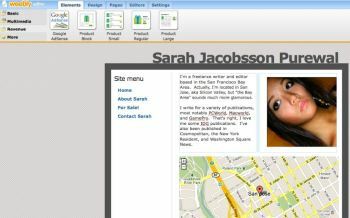 The Webpage editor's toolbar includes options such as Save, Edit, Design, and Admin. Clicking these either opens a menu of additional options or brings you to other pages where you can set up various services. While you're logged in to the editor, clicking any element on your website will open the element's "Editor" palette subwindow with tabs for options for editing text and styles, and more. Uploading files from your PC is a snap. Just click on the Files button in the toolbar to upload multiple images, video clips, or audio clips at once. If you'd rather use clip art or stock photos, Moonfruit has a library of images and multimedia elements. Once you've finished editing your website, click Save and your site will go live. Moonfruit's basic services are free for one website with up to 15 pages, 20MB of online storage, and 1GB of monthly bandwidth. To use Moonfruit's free features, you also have to update your site once every six months. For those who need more, Moonfruit has packages from $6 to $50 per month ($54 to $450 per year if you pay annually). Its Business package is $25/month or $225/year, offering 15 websites with unlimited pages, 2500MB of storage, and unlimited bandwidth. That package also features an $80 Google AdWords voucher, email support, two domain names (with email addresses), multiple site administrator accounts, and PayPal integration. Moonfruit Pros: Extremely customizable designs; plenty of attractive themes; small and unassuming ad on free pages; multiple packages; publishes in Flash, HTML, and mobile-optimized HTML5. Moonfruit Cons: The WYSIWYG editor has a steep learning curve. 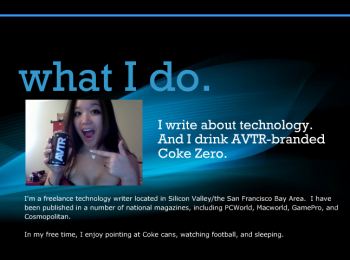 Weebly's online website designer is a little easier to use than Moonfruit's. Unfortunately, you are giving up some design elements; many of Weebly's themes are the same as those offered by WordPress. Like Moonfruit, though, Weebly optimizes your site for mobile devices. It's easy to get started with Weebly. Just go to its home page and fill in the form. Then tell Weebly whether you'd like to use a free Weebly.com domain (such as http://yourname.weebly.com), register a new top-level domain, or use a domain you already own. Next, you'll be taken to the Weebly webpage editor. Unlike Moonfruit, Weebly builds your site and then lets you choose a theme, if you want one. The basic template resembles a blog, with an image, a menu bar, and a blank space where you can drag elements. If you'd like to start with more direction, you can click on the Design tab at the top of the page and choose one of hundreds of premade designs. You're not going to find the fresh, modern layouts offered by Moonfruit. The Weebly editor is relatively straightforward, but you can't upload more than one file at a time. Weebly's drag-and-drop webpage editor features tabs with toolbars. To add an element to your page, just click on the Elements tab and find the object you want, such as a Paragraph with Title, Video, or Contact Form. Then click the element and drag it onto your webpage. It's simple to edit elements, such as an image; just mouse over it and click on the Click here to edit button. A toolbar will appear with big, easy-to-use buttons. Once you've built your website, just click on the Publish button to send it off to the Web. The Basic option of Weebly is free, while Weebly Pro costs less than $5 per month. The free version is decent, offering two websites with unlimited pages, bandwidth, and storage, though you're limited to a 5MB upload maximum. Weebly Pro costs $4.58 per month for six months, $3.99 per month for 12 months, or $2.99 per month for 24 months. You can create up to 10 websites per account. It offers additional site elements, including video, audio, embedded documents, and password-protected pages. With Weebly Pro your file upload limit increases to 100MB per file, and you can delete or customize your page footer. (The default footer is "Create a free website with Weebly.") Weebly Pro expands customer support and provides expanded visitor statistics that let you see top pages, search terms, and referring sites. Weebly Pros: Easy WYSIWYG editor; in-browser image editing; search for Creative Commons licensed photos; unlimited bandwidth and storage with free version; affordable paid version. Weebly Cons: Themes are limited, and all look similar; page layouts have little flexibility; you can't upload multiple files simultaneously. Qapacity is a website host and editor with a business focus. Unlike other editors, Qapacity has its own little "business" social network; instead of adding your website, you add a "service" to Qapacity's network of businesses, and then build an associated website to promote your service. Getting started with Qapacity is simple: Fill in your name, verify your email address, and then click Add Service. Unlike other editors we've looked at, Qapacity is designed especially for business owners offering specific types of "services" rather than products. Qapacity offers tools for sharing and receiving feedback on your services, and it adds your service to its marketplace so you can try to reach new clients that way. With Qapacity, you start by adding your service and a description. Next, begin building your site. You can use premade themes (choice is limited to about 25, of which 5 are paid, "premium" themes), or design your own style using Cascading Style Sheets (CSS) language. Qapacity's website designer features a toolbar with options for adding pages and modules, changing the theme, and sharing your website. Qapacity steps you through creating a very basic Website. To add an element to your site, just click the "Add Module" link. You can add up to 10 elements per page, including for images, text, video, AdSense, Facebook fans, and RSS feeds. Editing elements is also easy: mouse over an element, and an "edit" button will appear. Qapacity's wizard walks you nicely through the basic informational elements of the website you're building in case you're unsure where to start. The wizard begins by asking you to write a good intro, and then steps you through adding portfolios of your work and basic contact information. Qapacity's basic features are free, including one website with five pages, 16 images, 1GB of storage, and 500GB of monthly bandwidth. Free users can't use their own domain name, access Qapacity's premium themes, or reach priority email support. Qapacity has a few packages for heavy-duty users, ranging from $12 to $40 per month--with a 30 percent discount if you pay annually. The $12/month Basic package is described as being for a "tiny business," while the $22/month Promote Plus package is Qapacity's most popular option. The Basic package gets you one site with 10 pages, 500 images, 3GB of online storage, and 1TB of bandwidth. You can use your own domain name, access premium themes, and have more than one blog on your site. The Promote Plus package offers one website with 15 pages, 1500 images, and unlimited online storage and bandwidth. The most expensive package, Pro Brand, provides a custom-built website based on the Qapacity design of your choice. Qapacity Pros: Integrated marketplace for selling services; business-focused; the Qapacity ad on free pages is small. Qapacity Cons: Not very many themes; website editor can be confusing.